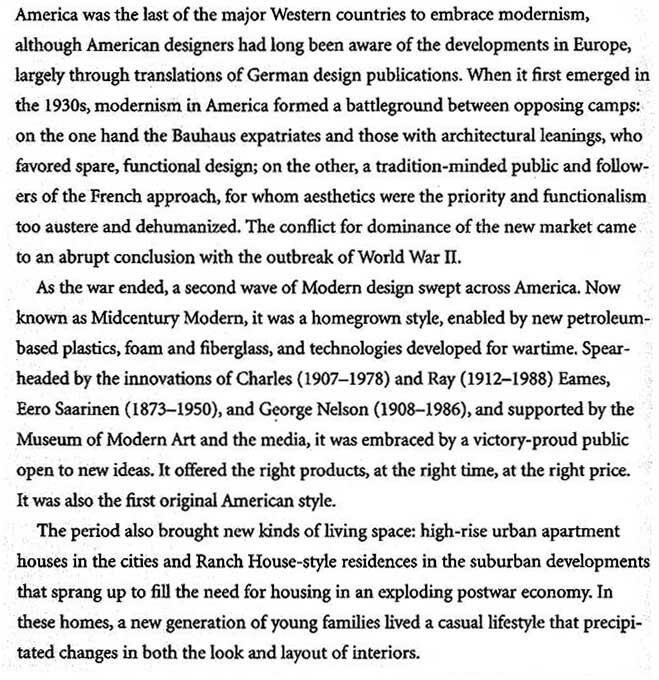 “Modern” refers to a design movement that was popular in the United States from around 1925 to 1975, whereas “Contemporary” is an ever-evolving style that refers to what is popular at the present time. "Although used interchangeably by many, modern furniture and contemporary furniture are not the same. While they may have a lot of similarities in terms of the clean lines and minimalistic look, they bear striking differences as well. "Modern-style furniture focuses on simplicity and function. The colors tend to lean on the neutral shade and the materials are often natural like leather, wood, and polished metal. One typical living room furniture set in modern style will be a white leather couch, with an emphasis on lines and geometric shapes. It is clean and clutter-free, streamlined and unadorned. "The contemporary furniture adds more zest and character. Along with leather, metal and wood, glass and stone are now part of the materials commonly used. Pops of color are usually seen on this design style. If modern style loves lines, contemporary styles still uses lines but also loves curves. To give a clearer picture, contemporary living room furniture set can be a more rounded neutral-colored couch with an accent chair in a different color." The modern movement in furniture design began in the late 19th century with the emergence of the Arts and Crafts movement in England and Art Nouveau in France. During the 1920s, two important decorative styles evolved, Bauhaus and Art Deco, which reflect, in part, radical innovations in painting and sculpture. Bauhaus style derived from the Bauhaus, a school of art and design founded in Germany in 1919. More innovative than Art Deco, Bauhaus design, also known as the International style, focused on new industrial materials, machine production, and severely functional forms totally unrelated to those of the past. The designers were motivated by a desire to create furnishings that were functional and made of materials used in modern architecture and that could be mass-produced while remaining attractive and comfortable. The movement was concerned not only with design but also with materials. It recognized that mass production was most suited to industrial products such as chrome, steel, plastic, and glass. Slim lines, a bold streamlined look, and a highly functional character typify modern furniture. 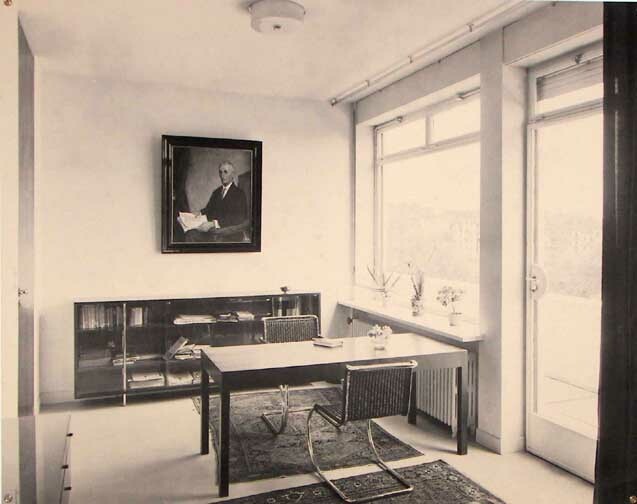 Many of the Bauhaus's finest designers, including Marcel Breuer and Ludwig Mies van der Rohe, emigrated to America when the rise of Hitler closed the Bauhaus, and after 1940 the U. S. became the center for this movement. Because the innovations of Bauhaus design have become virtually synonymous with modern design, furniture in this style is commonly called"modern." The tubular-steel chair with cantilevered seat became a symbol of the modern age, and was much imitated by American manufacturers. The modern style remains the dominant theme in interior design even today, although the movement has undergone various modifications over the years. Wood, largely repudiated in the 1930s, is once more popular, spurred on by new designs and the sophisticated use of lamination. The introduction after World War II of new plastics and molding techniques has resulted in a generation of molded plastic furnishings. Epitomizing this approach were Charles Eames's revolutionary plywood or plastic chairs, molded to the shape of the human body. Finally, while the earliest designers in the modern vein were concerned with mass-produced works, craftsmen after World War II have turned again to handmade, highly individualistic pieces. Produced in small quantities, these are already attracting collectors' attention. Mid-century Modern describes an era of style and design that began roughly in the mid-1940s and continued into the mid-1960s. It is an organic offshoot of Modern design that’s often associated with the casual furnishings and carefree look of Eichler tract homes in suburban California during the 1950s. In addition, the Mid-century Modern era is noted for the mass-production of household objects, from furniture to clocks to lamps to radios, because many of its chief designers (Charles and Ray Eames foremost among them) made it a requirement that their work be affordable to the average homeowner rather than the wealthy elite. The United States, Britain, Japan, and Scandinavia were centers for the Mid Century Modern aesthetic. In the U.S., Herman Miller produced plywood, fiberglass, and wire-mesh chairs for Charles and Ray Eames (the metal chairs with covers designed by Alexander Girard are highly collectible), as well as the famous Marshmallow sofas for George Nelson. Knoll made insect-like wire chairs for Harry Bertoia and cool, white-and-red fiberglass-and-aluminum Tulip chairs for Eero Saarinen. Japanese designer and sculptor Isamu Noguchi, a giant of Mid-century Modern, designed for both Knoll and Herman Miller. His three-piece wood and glass table from 1948 has been a mainstay of the Miller catalog for more than half a century, while the bases on his tables for Knoll used metal rods in a way that was very similar to some of the Eames’s chairs. Japanese-American George Nakashima, who was interred during World War II, designed for Knoll but also brought a woodworker’s sensibility to his furniture, often using the natural and even deformed shapes of his raw materials to lead him. And then there were the Scandinavians. Børge Mogensen designed chairs of elegant simplicity that harmonized form with functionality, while his Sleigh Chair was as whimsical as its name suggests. Arne Jacobsen’s Swan chair held its users in a palm-like embrace. Finn Juhl took a more sculptural approach for his wood-frame seats — even a Juhl coffee table looks like a work of art. As for Hans Wegner, he made a chair that was so highly regarded it was used by Nixon and Kennedy in a 1960 presidential debate and has since become known simply as The Chair. Furniture was not the only product of note to come out of the Mid-century Modern movement. For some reason, clocks, especially wall clocks, became a design force to be reckoned with. When George Nelson wasn’t designing furniture for Herman Miller, he was working with the Howard Miller Clock Co. on a series of marvelous modern wall clocks. He made clocks whose hands pointed to colored balls on the ends of slender shafts; clocks that resembled sunbursts, sunflowers, and asterisks; and even a clock that suggested a human eye. Nelson and Miller were also responsible for the Bubble Lamps, which were made of steel and translucent plastic and were designed to hang from the ceilings of Mid-century Modern homes, either as individual globes, ellipses, and cylinders or in clusters. Other lamps popular during this period, and produced by a wide range of designers and manufacturers, were the pole-tension lamps that lit up corners of livings rooms and the "atomic" boomerang lamp shades designed for table lamps. Nothing escaped Mid-century Modern, from transistor radios to lava lamps, which had yet to be associated with the psychedelic 1960s still a few years a way. It was perhaps the last time that design drove the look and feel of popular culture. Soon, the roles would be irrevocably reversed. worked with Hille Ltd. to create everything from convertible beds to tables and chairs. He is also credited with designing the first polypropylene stacking chair. In architecture and interiors, Art Deco emphasizes ornamentation for the sake of ornamentation and repetition within the designs. Typical details include repeating geometric shapes, symmetry, block-like structures juxtaposed with rounded corners, parquet floors, zig-zags, and emphasis on entrances. Both the Chrysler building and Empire State building are iconic symbols of the design style. Mid-Century Modern design departs from the excess ornamentation of Art Deco with a movement towards clean lines, simple designs, and a lack of details resulting from the idea that function should dictate form. 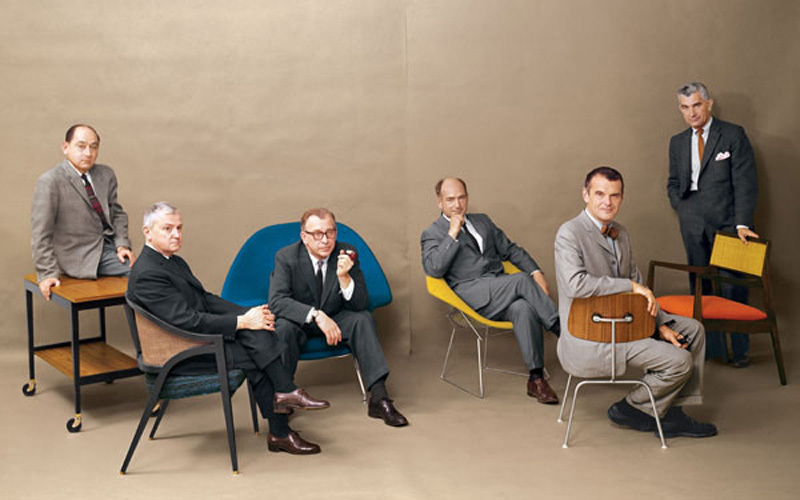 Design icons such as Frank Lloyd Wright, Charles and Ray Eames, Herman Miller were pioneers of the movement. Mid-Century Modern interiors tend to be open concept. Every design element has a purpose. Designers often use neutral colors, a mix of man-made materials such as plastic or metal and natural, organic materials such as teak and walnut woods. Split-level homes, large floor to ceiling windows, and integrating design with nature and natural surroundings are all elements of Mid-Century Modern design too.